How Foreclosure Works in South Africa and How It Differs from the U.S.
Statistics from the National Consumer Regulator in South Africa (NCR) show banks repossess nearly 2000 homes every month and auction them without assessing their fair market value. Underwater homeowners are left indebted for years because if banks are not able to recover outstanding loan amount, they have the right to sell off movable properties such as a car or furniture and can demand payment from the borrower for the remaining balance if there is still a shortfall. Foreclosure is commonly known as ‘repossession’ in South Africa. Laws are a bit ambiguous, and people in the real estate industry allege South Africa is in the Stone Age when it comes to home repossessions. Making foreclosure laws more consumer-friendly is a long standing demand. Once a borrower is behind on mortgage payments, bank representatives contact him or her by phone and mail. They try to understand a borrower’s individual financial situation and offer a few foreclosure alternatives accordingly. If you assure the bank that you would be able to keep up with your current installments, you are given an opportunity to catch up on a few missed mortgage payments over a set period of time in the future. The option is similar to forbearance in the U.S. where banks suspend the payment of a few mortgage installments if you are unable to pay due to job loss, sudden illness, the death of spouse or other similar circumstances. Banks can change the terms of the loan, spreading out the loan repayment period. It results in lower amount of monthly mortgage installments for the borrower. It’s similar to loan modification in the U.S. Under the National Credit Act in South Africa, banks have to give borrowers an opportunity to seek debt counseling within a certain period of time. Banks have to follow guidelines laid down by the National Debt Mediation Association (NDMA) when participating in debt counseling arrangements. Borrowers can sell off the property before the foreclosure process begins. Various banks offer different assistance programs to distressed homeowners who want to sell the property before foreclosure. Most of these programs assist homeowners with selling and marketing their properties with the help of estate agents in healthy, non-distressed circumstances. If a borrower chooses not to sell before the legal process begins and the bank has determined that he or she will not be able to pay the mortgage installments, the bank repossesses the property. The legal department of the bank applies for a legal summons from the High Court of a Magistrate. A sheriff of the court provides the summons to the distressed homeowner. The bank then submits an application to the High Court, seeking permission to foreclose the property through a sheriff of the court. The court determines whether the bank has adhered to the legal process before granting the repossession permission. Home repossessions are carried out through a sheriff, meaning that only a sheriff appointed by the court can take possession of the property. Debt collectors, bank representative or estate agents are not empowered to foreclosure. Home owners can contact the South African Board of Sheriffs if they feel their rights were violated or norms were not adhered to during the foreclosure process. A reserve price is set by the bank on the property to cover the outstanding debt, and if this reserve price is not reached at the auction, the bank will buy the property, and it then becomes a property in possession. The sales proceeds cover the outstanding loan amount and costs incurred during foreclosure. If the proceeds from the auction exceed the mortgage, the remaining amount is paid to the borrower, but if there is a deficiency, the bank can sell the borrower’s movable property. The borrower may have to pay the outstanding if the bank fails to recover the loan even after selling off movable property. While South Africa follows a set of foreclosure rules, the biggest loophole is the reserve price set by the bank. There is usually a significant different between the reserve price and the property’s actual market value. All a bank wants is to recover the outstanding loan, so they set the reserve price too low, giving speculators a field day at auctions conducted by a sheriff of the court. Speculators get away with purchasing the property 50 percent below market value in some cases. There are hardly any profits left for the homeowners from the proceeds of the auction. Following a strong protest against this practice, the South African government has proposed some amendments to the law that will require the banks to provide a fair market price of the property. Besides it won’t be compulsory to set a reserve price. 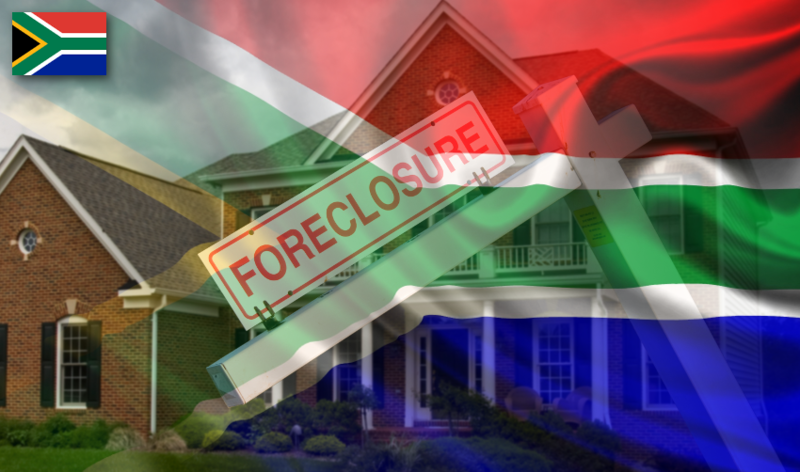 How Foreclosure in South Africa Differs from the U.S.
Foreclosure laws are state specific in the U.S, while they are federal in South Africa. The foreclosure process in some states is judicial, and in others, it’s non-judicial in the U.S., But in South Africa, all home repossessions are performed through a court, making it a judicial process. While you can sell your home even after the legal process of foreclosure begins in the U.S (called a short sale), the only option in South Africa is auction through a sheriff of the court. You can sell the property before receiving a summons (called a notice of default in the U.S.) in South Africa. Foreclosure alternatives like deed-in-lieu of foreclosure or lease option which are quite popular in the U.S. are not prevalent in South Africa. You can’t save your home by filing for bankruptcy in South Africa, while you can file for bankruptcy in the U.S. to avoid foreclosure. Your bank can’t foreclosure if your application for loan modification is under consideration in the U.S., but the court can issue a summons even if other options are available in South Africa. Your lender can foreclose only your home in the U.S. Other movable assets are out of bounds, but they can repossess your movable properties like car and furniture in South Africa. Increasing cases of evictions have led to public unrest in South Africa. One of the public movements is the Western Cape Anti-Eviction Campaign that aims to fight evictions. People are demanding foreclosure laws be made more relaxed, and the rights of homeowners be protected the same way as they are protected in other European and Western countries. The current foreclosure process isn’t beneficial to the country’s banking system as well. Some studies show that the banks would recover a much higher amount if repossessed homes are sold on the basis of their market value. This would also leave the defaulting borrower with a smaller outstanding loan to the bank.